Flora Nectar Fruit-n-Fusion 0-0-1 contains all natural raw cane sugar, molasses, malt syrup, select plant based esters, L-amino acids, organic acids, polyflavonoids, vitamins and essential minerals. This unique blend of ingredients helps your plants regulate enzymes that trigger specific reactions involved in maintaining optimal metabolism. This allows your plants to achieve a balance between respiration and photosynthesis in high intensity growing environments where the rate of respiration can sometimes exceed the rate of photosynthesis. 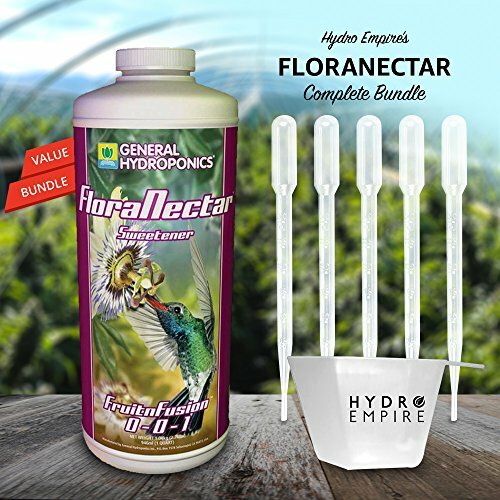 As a result, Flora Nectar Fruit-n-Fusion ensures optimal metabolic rates during the flowering and fruiting phase when nitrogen levels have been reduced. 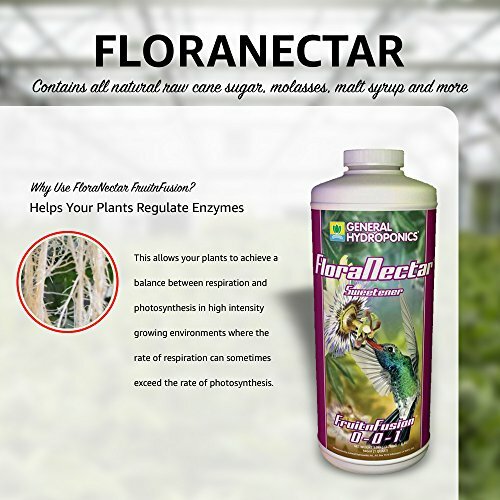 Flora Nectar Fruit-n-Fusion also promotes a sturdier plant structure during the vegetative phase when high levels of nitrogen are present. 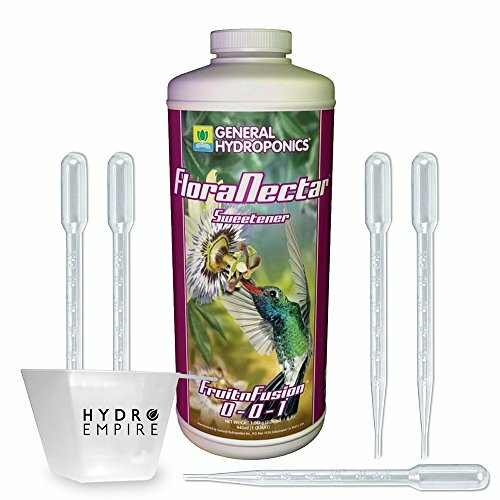 Flora Nectar Fruit-n-Fusion fulfills the additional energy requirements of your plants throughout all phases of growth and during stressful times of transition. This stuff is good. It has bioactive esters inside that give it that amazing REAL fruity berry smell. These esters are easily uptaken by the plant and permanately deposited unchanged in the plant itself. The sugars in the product do not do anything except feed the beneficial bacteria in your medium! ✅ [PROVIDES EXTRA SWEET AROME TO FLOWERS] – FruitnFusion will work very well to provide for an extra sweet aromatic coming from the flowers with increased vigor! 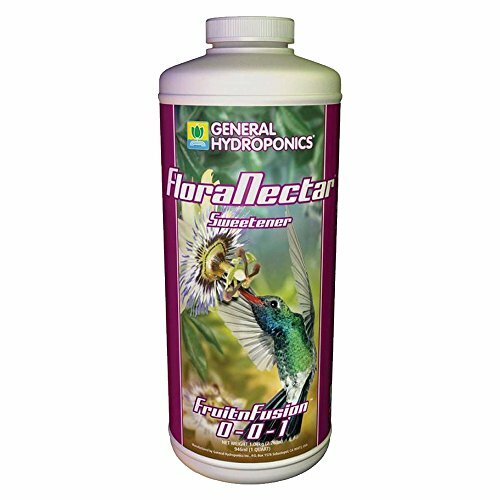 ✅ [PROMOTES STURDIER PLANT STRUCTURE] – General hydroponics FloraNectar FruitnFusion promotes sturdier plant structure to support heavier yields during the vegetative phase when high levels of nitrogen are present. ✅ [REGULATES PLANTS RESPIRATION AND PHOTOSYNTHESIS] – Balances rate of respiration and photosynthesis to ensure optimal metabolic rates occur during flowering and fruiting when nitrogen levels have been reduced. 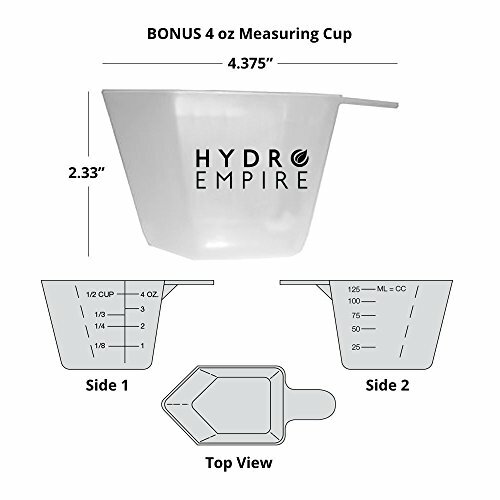 ✅ [EASY TO USE WITH THE INCLUDED TOOLS] – With the included tools in the General Hydroponics Flora Nectar FruitnFusion Quart 32 ounce bundle there are five 3ml pipettes with 0.5ml graduation and a 4oz BPA FREE Hydro Empire Measuring Cup perfect for using just enough solution that is needed. Don’t hesitate to buy one of the best fertilizer bundles on the market.